At first glance, you’d assume that the release of our annual Eddy Awards would simply be a celebration of the new for its own sake. True, any collection of the very best products of the year is going to focus on things that are shiny—otherwise we’d just give the Best Mac award to the Mac IIci every year and knock off early. But when Macworld editors sit down to pick our favorite products, the shininess of the technology generally gets ignored in place of its practicality. Being new just isn’t enough. Eddy commands you to keep QUIVER in mind. There’s no spreadsheet or point scale. We use QUIVER as a general guide and we hash it out until what’s left are roughly three-dozen (this year it’s 32) Mac products we love. As I look through our final list of 32 Eddy winners, I’m struck by how many of them have actually changed my everyday life for the better. Sure, the iPhone has actually made me reliably reachable by phone for the first time in human history. But consider the smaller products: I use HandBrake to put my DVDs onto a video iPod so that my kids can watch something appropriate on long plane trips. Red Sweater Software’s MarsEdit has become the de facto writing tool for several Macworld blogs, not to mention all my personal blogs. In November I was one of tens of thousands of people to participate in National Novel Writing Month, in which to write 50,000 words of fiction in just 30 days. And for those 30 days I used Literature & Latte’s Scrivener to not only write my story, but keep track of way too many characters and plot strands. In the darkest depths of writer’s block, Scrivener was there to give me a swift kick, keeping me on track and in sight of my goals. I could go on, and so could the rest of the editors and writers here at Macworld. This year’s award winners didn’t win just because they’re new — they won because we love them. 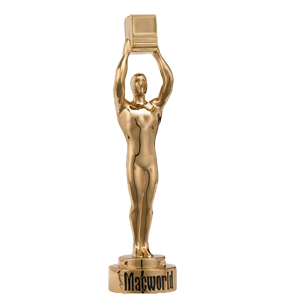 (Trust me, a product can’t win an Eddy Award unless there are passionate Macworld editors who are willing to lay out a strong case for its inclusion.) We feel passionate these products because they’ve made our work or personal lives better in some way. I hope you’ll find that some of them can improve your life, too. One thing you’ll notice in this year’s Eddy Awards list is a complete lack of any Mac systems from Apple. Oh sure, there’s an iPhone, an iPod, even an AirPort Extreme Base Station. But to be honest, we couldn’t find the enthusiasm for any of Apple’s new Macs this year. Sure, they’re all better than last year’s models — but not so different from them that we felt they truly represented enough innovation over the previous models to merit an award. What’s interesting is, there wasn’t even much of an argument about it among our staff members. There were some nice incremental speed boosts to the Mac line, particularly when it came to laptops. And the new iMac, which is an impressive system on its own right, didn’t feel dramatically different enough from its predecessor beyond the changes to its surface appearance. Arguable? Sure — what awards aren’t? But as the saying goes, “the Eddy Awards are a survey of editorial preference.” At the end of the day, these are the products we loved this past year.